Photos by my brother. Well, I didn't want HIM in the pictures did I?? Over the Valentine's weekend I managed to drag everything I'd been purchasing and putting together over the past few months to sunny northern Arizona and play with as much of it as I could. I managed to non-scientifically test most of it...at least the big chunks. Thanks to the U.S. Forest Service (I'm sure they kept the trees in the area from buring down at some point in the past) we had only a skinny section of the sky to look at from my brother's back yard. There was about a three-hour observing window for any object around the celestial equator that happened to miss the big tree in the neighbor's yard. My brother's trees took care of the rest of the sky, except for a two- to four-hour long hole in the circumpolar region. We set things up in the walkway between his house and a nice partially covered deck/bar whose floor is about five feet up on the right. It was good enough for this outing. Everything was handy, well protected, wasn't covered with mud, and the bar was right up the steps. Even the wood deck ended up being plenty stable enough for our purposes. What is that white thing at the end of the tripod leg? It's a hockey puck. As far as I can tell the pucks didn't make the tripod vibrate, but that's all I can say for sure. Next time I'll set up on cement and see if I can determine if they help or not. It all seemed pretty vibration free. Yes, that's snow in the background. I loaded up both barrels on a Losmandy side-by-side mount. 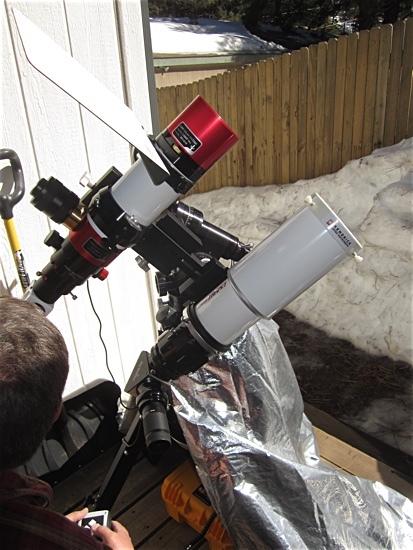 A Lunt 60mm double-stacked pressure-tuned Hα (Hydrogen alpha -- not funny 'Ha') is on the top, and a Sky-Watcher Esprit 80mmED APO is on the bottom. I'd had the Sky-Watcher since December, but hadn't even looked through it. Seemed like as good a time as any: The object of interest wasn't too hard to find, and if anything was seriously wrong you'd only lose an eye and some eyelashes. What's a little singeing? After getting the tripod level, eyeballing North with an iPad compass, dialing in a polar elevation within a degree or two, hooking up the drive motor system on the Losmandy GM-8 mount, getting the scopes mounted and everything balanced we were off to the races. 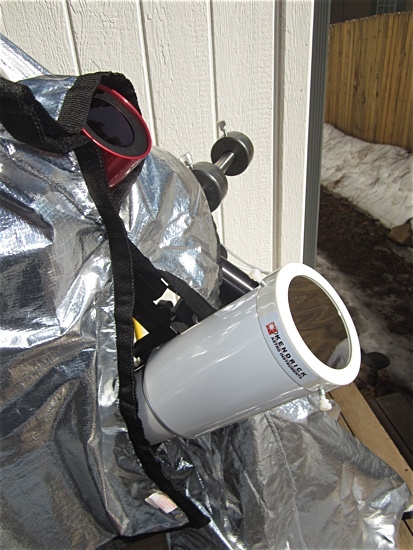 The Kendrick solar filter I bought for the Sky-Watcher worked perfectly. Stellar -- pun unavoidable -- image quality. I put an ND25 filter on the ocular and that knocked the brightness down...well...about 25%. I didn't get a chance to try the ND50, yellow, or green filters that I had to see what they would do. Next time. The wire dangling from the Lunt's focuser is coming from the JMI MotoFocus unit that I modified. I didn't need it this time for its intended purpose -- focusing when using the ASI camera, since I didn't hook up the camera this outing -- but it seemed to perform really well. There was no jumping around or shaking or stopping late or anything bad. I think it will work out fine. 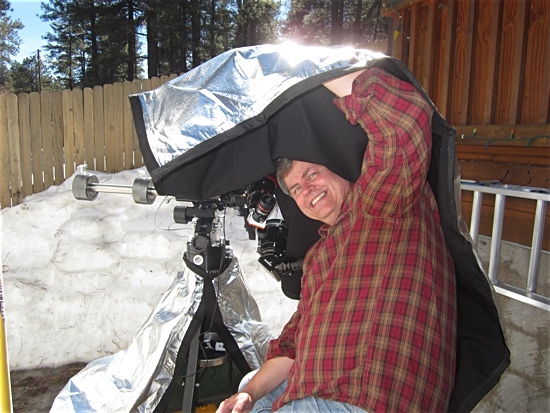 Since the early days of my solar observing career (all two months ago) I've been worried about the New Mexico not-Winter sun beating down on the equipment. When I switched to the Losmandy "New Zealand All Blacks Edition" mounting system that was enough to push me over the edge and get me to buy Telegizmo's Telescope Tripod Cover for as much of the mount as it would cover, which was all of it, and their Solar Observing Hood for as much of the scopes and me as it would cover. Both items worked quite well. The tripod cover is just the reflective material in the shape of a cone and some velcro. The hood is the same material in the shape of a big rectangle, but with a fabric liner to keep the light out. The hood is probably heavy enough to check its effect on the mount balance. You wouldn't want to burn out any drive motors. The smoke would collect in the hood and make you cough for sure. In the picture above you can see I'm not using the supplied coily wires that run between the Losmandy Digital Drive System (under the tripod cover) and the two drive motors. I had two cables made (which you can do yourself with a few tools) to replace them. The original ones seemed a bit long and heavy and were prone to getting involved with parts of the mount that they shouldn't be involved with. My replacements are 2' long for RA, and 3' long for Dec straight 6P6C RJ-25 cables. Other than getting a little stiff in the cold they worked well. Hardly even knew they were there, except when I pushed the buttons on the hand controller and I could see the mount move. I did use the original coily cable for the hand controller. It remained flexible down to at least freezing. I probably could have arranged the two 7-pound counterweights a bit better. I have a 5.5-pound weight on order for when I'm using the Lunt scope by itself. One 7-pounder is just ounces too heavy and has to be moved all of the way up on the counterweight shaft such that the head of the locking screw starts to run into things as you move the scope around. The 5.5-pound one might also work when the Sky-Watcher is by itself, but with a DSLR on the end of that scope maybe not. I also have an 11-pound weight that might have been able to replace the two 7's. I'll do some testing at the Living Room Proving Ground when the 5.5-pound one shows up. With scopes the size of mine the hood gives good coverage. I was thinking that it might be nice to make the cover more like a shade for outreach events with one or two heavy microphone stands to use to hold the back two corners of the cover "out" away from the scopes, but there might not be enough material for the stand(s) to stay out of the way. Maybe one or two sticks attached to the tripod somehow, since the scopes won't be moving around much during solar observing. It might make things a little jiggly if there is much wind, but might be nice to have if there isn't. It's 58" x 50", so it could almost be spread out and mounted as a canopy over everything. I liked the Astro Chair that I bought, but I did notice that you can't just grab the front edge of the seat and drag it to you to position it. That usually disengages the seat and you have to stop and position the chair and then re-engage the seat at the height you want. It's a minor thing. If it were too hard to dis/re-engage I'd be complaining about that. The front side of the hood is Velcro strip all the way. You can wrap it around as many scopes as you can afford, or afford to get away with buying. Again, that Kendrick filter gave a really nice image, and no, I didn't position the filter that way for advertising purposes. It just happened to end up there. I suppose the scope had something to do with the nice image too. I'm happy. It all worked. Now I just need to learn how to do something useful with it all. Great day! 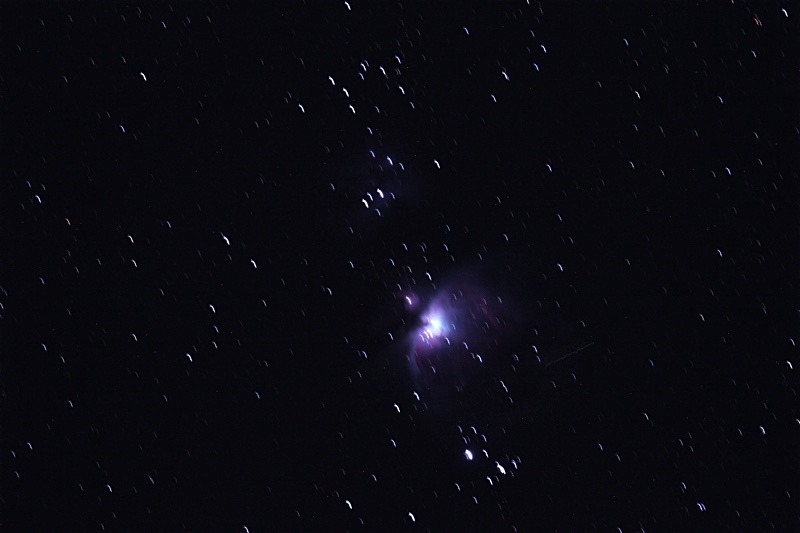 If you've ever seen one of the silent movies featuring the Keystone Cops you'll have an idea of the antics that went into producing this picture of M42 in Orion. It just happened to be in a clear area of our tree-infested window of opportunity in the evening, so we gave it a shot. The Sky-Watcher is more made for attaching a camera than it is for attaching an eyeball. My brother just happened to have a Canon 60D. The scope came with all of the parts and an adapter for connecting Canon cameras. How could we resist? 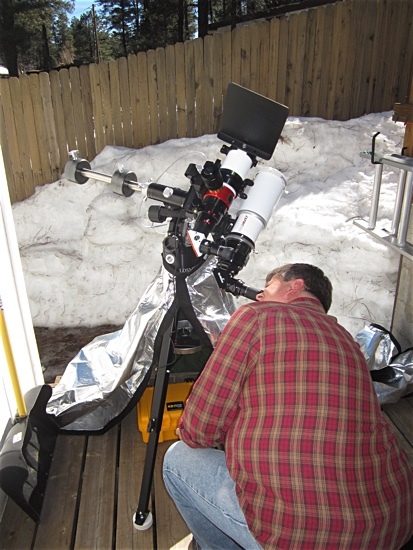 A couple of nights after the solar session we set everything back up, but with just the Sky-Watcher mounted. After a bit of time fiddling with the camera (I've never really used a DSLR before for anything other than taking regular pictures, and neither has my brother), and rifling through the user manual for a while we managed to get the camera to do what we wanted it to do. Mostly. We got things to where we could see what was going on before taking the picture to focus, got the shutter to stay open by one of us scotch taping the shutter release button down, and we managed to bang the telescope with the sun shield that was previously mounted to the Lunt scope while using it as a shutter. Can't ask for much more than that. The exposure was about one minute long. We just stood still and counted out loud. 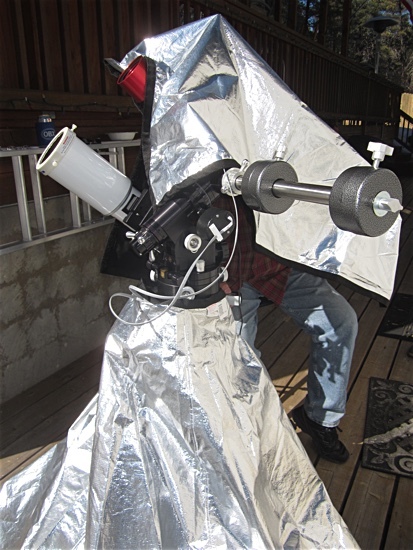 When finished we put the sun shield back over the front of the scope and released the scotch tape. We tried different things several more times, but this first picture was the best. I guess practice doesn't always make perfect. At least we confirmed that banging the scope with a piece of metal while the camera shutter is open really does make the scope wiggle, and how much. A remote shutter release is on order. The last nighttime astrophoto I took before this was with a Nikon FM loaded with Tri-X film on a 1970's C-8, so this was a blurry, but real eye-opener. It's almost too easy once you figure out what you are doing and have all of the parts. Now I suppose I'll have to get a camera. We were going to shuffle everything around on the deck and shoot the moon, but it started getting cloudy, so we packed it all up and had a couple drams of scotch, instead. Great night! 1. I extended the tripod legs about 12". They could have been another 12" or so to get the scopes up a bit more. Instead of extending the legs more next time I've ordered the Losmandy 12" extension that goes between the tripod and the equatorial head. It was nice having the legs of the tripod not stick out so far beyond the immediate work area that they became a trip hazard. The extension should help keep it that way. During the solar session I also could have meridian-flipped everything to help a bit, but we would have needed to move everything to keep from being pinned against the side of the house. 2. The two thumbscrews that hold the diagonal in place on the Sky-Watcher, the thumbscrew that holds the 2" to 1-1/4" reducer in that diagonal, and the thumbscrew that holds the eyepiece in that reducer are all cheapie chrome slippery short small diameter thumbscrews. 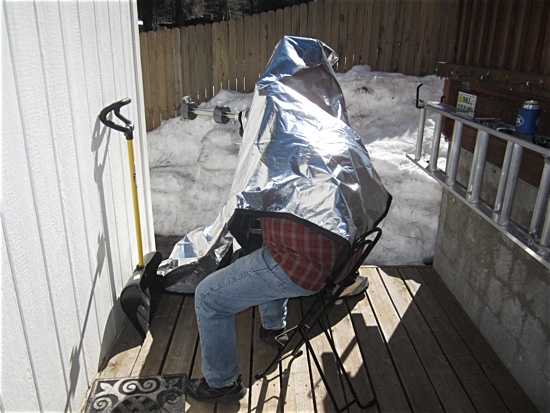 It wasn't bad, because it wasn't very cold, but they would be a bit of a nuisance if you had to wear gloves. 3. The two scopes mounted together didn't quite point in the same place. At low powers with the sun centered in the Lunt it was just off one edge of the field of view in the Sky-Watcher. I just had to slew in declination to switch between the two scopes. The Sky-Watcher has a factory supplied dovetail foot. That foot has a plate on the bottom that has a not so thin piece of rubber glued to it. That rubber may have contributed to the problem. I didn't want to start taking the scope apart until I knew that it worked. Now I know it works and the plate with the rubber is gone. I'll retest the alignment of the two scopes, or figure out what's going on next time. For those that have this scope the plate is held on with four small Phillips head screws. You just have to peel up the rubber a little bit in each corner to get at them. 4. I need a way to mount the Sol-Searcher on the Sky-Watcher for when I use it by itself. I think I'll make a block that looks like the dovetail on the regular finder scope that came with the Sky-Watcher and shape it to look like the top of the Lunt scope where the Sol-Searcher mounts now. I'll use the same magnetic technique as I did on the Lunt to attach the Sol-Searcher to the block. The block will then just go in the regular finderscope saddle on the Sky-Watcher. Easy-peasy, except for the 'I'm not a machinist'-part.